If you think lions and tigers are the toughest animals in the world, you are so wrong and in for a surprise when you read this article. The toughness of animals depends on various factors including where they live and how they survive. From saltwater crocodiles to Honey Badgers, here is the top ten list of the toughest animals around the globe. According to the Guinness Book, the Honey Badger is “the most fearless animal” on the whole planet! It looks like a weird skunk, these are the largest species of terrestrial mustelids in Africa. They are also found in Southeast Asia and the Indian subcontinent. These are the psychopaths of Savannah as they kill anything and everything smaller than their size and if any large animals (horse, cow and so on) steps on their nests or dens, they attack without any second thoughts. These are not invincible nor are they on top of the food chain, but for their small size, they are tougher than you imagine. These species have evolved to digest bones and even feathers of their victims and they do not have many predators because it’s just not worth the risk. The species can mate throughout the year, howvever, they prefer September and October. The pregnancy in females last for 6 to 8 weeks and ends up with 1 to 2 babies. The cubs stay with there mother until they reach the age of 16 months. The average lifespan of the species is 8 year in the wild and up to 24 years in captivity. It has three predators namely lions, leopards and humans and they are active both at day and night. Tardigrades are also known as water bears or space bears and they are rarely found to be greater than 1.5mm in size and they are visible only under a microscope. But do not let that size fool you as these are one of the most resilient animals on Earth and they can survive even in outer space. These are carnivores and even cannibalistic. These are considered to be one of the toughest and almost indestructible because they can survive in any habitat even in conditions where a human being would die in a matter of seconds. From brain freezing temperature to extremely humid conditions, they can survive everywhere. The scientists have listed these species in the extremophiles because they are capable of surviving in extreme temperature. Most of them are oviparous that means female species will lay an egg inside their shed cuticle and later males cover the eggs with the sperm. Only a few of them will not be covered under Tardigrade species because in this case, females have internal fertilization. Of course, size matters when it comes to toughness and that is just why the African Elephant is this high on the list. No living land animal is larger than this beast which stands over 13 feet tall and can weigh up to 15,000 pounds. One of the heaviest animals in the world, they can knock down trees at ease and they chow down more than 500 pounds of leaves and branches… in a day! With only the help of its trunk, it can carry up to 700 pounds! If all the animals were put together in a small, cramped area, this massive giant would probably come out on top. It is one of the longest living animals. African elephants can make a variety of sounds, however, the most common will be low-frequency sounds called “rumbling.” Because of the low frequency, the sound can travel farther than their higher counterparts and hence the range is extensive. The elephants have 22-month gestation period and when the calf is born aunts, sisters and cousins help them care the newborn species. According to the IUCN list, the species comes in vulnerable species. This is one of the few buffalo species which is not domesticated and there is a good reason behind this. Cape buffalo also famously known as ‘Black death’ is an extremely dangerous and unpredictable animal and it is responsible for the death of almost 200 humans per year in Africa. If hurt or maimed during a battle, a cape buffalo will move towards and confront the enemy rather than be backing off. These are resilient and tough animals and are known to kill lions and even lion cubs mercilessly. The animal species are known for its exceptional memories and it can recognize humans in the form of hunters that hurt them in the past and it will directly attack them in the next encounter. When the predator will attack, animals will form a circle around the young, weak or old animals. They will then expose their large and sharp horns toward the predators. These kind of barriers are very effective and helps them to save animals. These are aquatic animals but they spend quite a bit of time on land. One of the apex predators in the world, saltwater crocodile is the largest living reptile in the world and it’s broadly distributed all over the globe. You cannot question the toughness of this apex predator. Measuring 7-9 feet in length and weighing around 2,500 pounds, its one bite in enough to break and crush a cow’s skull! There have not been many cases of this crocodile attacking humans but if they do, there is definitely zero chance of survival. They are known to have one of the most powerful bites in the whole animal kingdom and can generate a force of up to 7,500 pounds per square inch. At the time of hatching, saltwater crocodile makes chirping sounds from within their eggs. The female species or mother then helps them by digging them out of the nest. After hatching, they will take them to the water edge by keeping them in the mouth and then they watch until they are able to look after themselves. This mighty beast ranks this high because of its robust attributes. It has a tough outer skin with a thickness of around 30mm. These are huge and unpredictable creatures and they account for the most human kills in Africa. They are not always aggressive and angry but if disturbed or provoked, they can be both. One of the fierce animals in the world have 20-inch strong-as-nail teeth which can bury deep into its prey and almost paralyze it. They wreak havoc on their victims and definitely will not spare them. It is listed as one of the most dangerous animals in the world. Komodo dragon gets its name because it is the closest reptile you will see resembling a dragon. Being the largest lizard in the world, it is gigantic, measuring 8 to 9 feet and weighing around 250 pounds. Komodo Dragons have a history of killing a number of humans. Its mouth is rife with bacteria so its bite is septic and this disarms its victim in a way. They eat almost 80 per cent of its own body weight in one meal. This is the largest carnivorous marsupial in the world and it is found only in the Australian island of Tasmania. One of the most aggressive animals has the strongest bite on the Earth when adjusted for size, as it weighs only about 220 pounds but can exert pressure up to 100 pounds! This force is enough to even crush a bone with a single bite and according to National Geographic, the Looney Toons character inspired by the Tasmanian Devil is not much of an exaggeration. 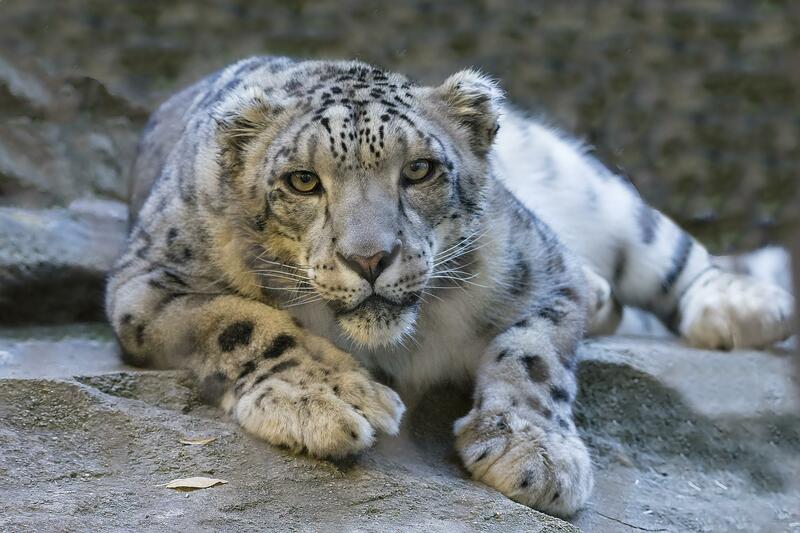 Snow leopards (aka Panthera Uncia) are found in the high, rocky mountains of Central and Southeast Asia. They are very adapted to the rough conditions where they are located. These leopards are primarily known for their gorgeous fur and they have large paws which almost look like snowshoes. They have powerful, mighty legs and can jump as far as 50 feet. It is one of the toughest animals in the world. It is one of the most beautiful Indian animals in the world. Do not disregard dung beetle because of its size, because the case here is simple: the dung beetle is the mightiest animal in the world compared to its body weight. Dung beetles can be found all over the world (apart from Antarctica) and they push fresh animal poop that weigh over 250 times their own bodyweight. A particular species called Taurus Scarab was documented pushing a ball that was 1,141 times to its own body weight. In simple terms, that is equivalent to an average human of 150 pounds pushing a weight of around 80 tons! So, these are the toughest animals in the world. Do post your comments.